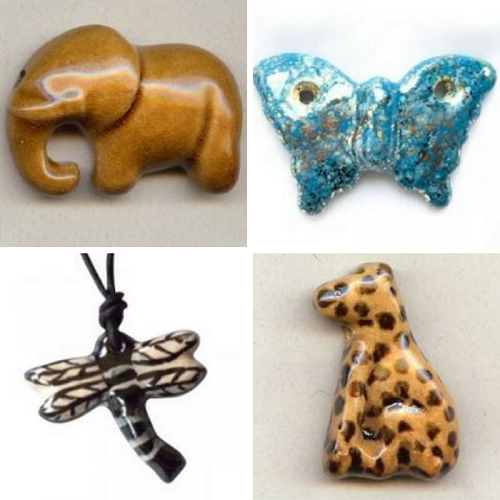 Kazuri, a Kenyan women's collective, are well known for their ceramic handmade beads and pendants. Some 200, mostly single women, are able to make a living to support their families. Lady Susan Wood, the founder of Kazuri died in 2006 but her legacy lives on. Born of missionary parents, she always considered herself an African at heart. Together with her surgeon husband, they also founded charities to aid the people they grew to love. She started the business with two impoverished women in a small shed at the bottom of her garden in the Karen Blixen estate, famous from the award winning movie "Out of Africa". That grew to the "factory" it is today, a vital local industry which many families depend on. The handmade and hand painted beads and pendants are indeed gorgeous. Kazuri West a US supplier for these lovely ceramic pieces is going to give a lucky winner a collection (not necessarily what is shown here) of ceramic pendants. Note Kazuri West ais also offering 30% off select beads and pendants from March 27th at midnight PST until 8pm PST on April 3rd. It is really up to you how to use Kazuri beads, buttons and pendants and make them shine in designs. One creative designer, British beader, Kerrie Slade did a wonderful job with the ceramic animal buttons. 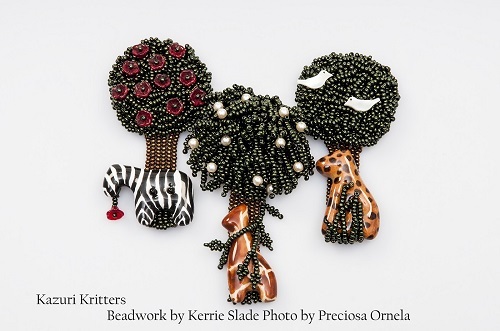 She shared how her amazing beaded Kazuri animal brooches, "Kazuri Kritters" were featured in the August 2015 issue of Bead and Button magazine. I have written a number of Kazuri inspired tutorials (see links below). My favorite has to be the tutorial to create the Kazuri Wire Tree of Life pendant. It was a blast working with Kazuri to test out their multi-hole pendant! You can use them the other way to hang dangles from but I like to have them upright to make the tree of life. Kazuri West has them 3 different colors of this large disc. Paulette Walther, the current owner of Kazuri West not only loves to support women's cooperatives but she is also into healthy living. Check out her Facebook page : KWest for Wellness. She shares many wonderful healthy recipes - I know because I have pinned some of them! 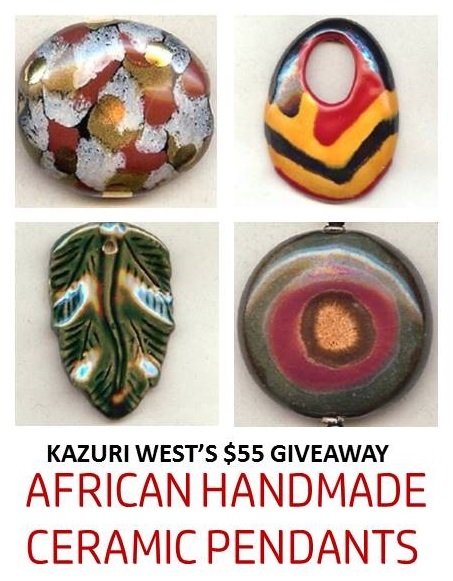 If you'd like to win this giveaway for a collection of Kazuri handmade ceramic pendants, please make a comment below. Make sure you leave contact info below if you do not have an online shop or blog. It ends in a week's time at 6 pm EST Monday, April 3, 2017. I will pick the winner randomly and announce the results as soon as possible after. So be sure to leave a contact email if you don't have an online link or make sure you come back and check! Otherwise I will redraw in a week. Good luck! I love Kazuri beads, and even own some. Have I done anything with them? No! They're just waiting for the right project to pop into my brain. LOL! I love Kazuri beads and only have one left, need more! These are gorgeous. And I love the fact that they are made by women to help women. Just tweeted about these wonderful beads and your giveaway. Love Kazuri beads and especially love that it's a cottage industry to help impoverished women support their families. I'm a blog subscriber and always eagerly await the next post. And thank you Kazuri West for this giveaway. Would love to try some of these beads. Some very beautiful beads indeed ! Beautiful! I love working with African ceramics. I love these items! Just beautiful, one of a kind items. Who wouldn't want to win these! There's something about ceramic beads that I just love. It might be the weight of them or the beautiful sound they make when they clink together - or it just might be the wonderful shine you get from ceramic glaze that makes them pop. I know every time I've used ceramic beads in a piece it has always sold. I'm always inspired by collectives that work together for a common goal and come up with such incredible work. It gives the resulting piece made with those beads an automatic history that customers love. Lady luck - I'm looking at you! Lovely beads. I love ceramic beads and what a great program. I would love to win this collection. I also subscribe and follow. What a nice giveaway ! I particularly like the elephant ! I am a follower , and I am happy to try my luck ! 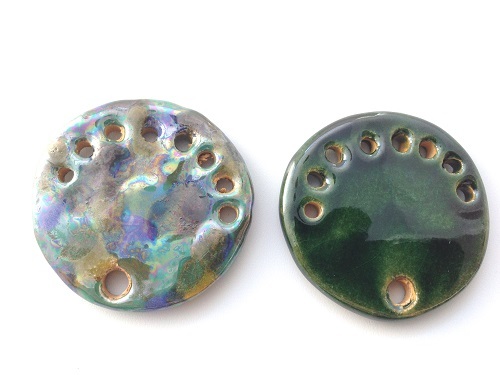 Beautiful beads finished with beautiful glazes!! Definitely coveting these now. I'm a subscriber, blog follower and facebook fan, reachable at retro-grrl@hotmail.com. I'm always on the lookout for interesting adornments for kumihimo braids. Kumihimo braids are essentially very organic in nature and, boy, would these add zing to the braids. Definitely add me to the giveaway. I love the depth of colors and richness that they get with their glazes. Ceramic is so much more than just pots and simple pendants. This proves it because they take the simple shape and add so much life into it. I really love the shimmer ones, the black and white, and the dragonfly ones. This reminded me of the time you shared your support for the elephants. It has stuck with me to this day and now really try to look for people who support things like you do. Best blog is a bonus. Lori - your words describe so well what the Kazuri beads are like! Thanks also for your kind words. It is important that we all come together to support those who have no voice and no choices. The dragonfly bead is my fave! I own a few Kazuri beads. I am learning kumihimo, a Japanese braiding technique and I intend to use some of these beads with my braids. These beads are amazingly beautiful. I would love to make a tree of life pendant. And I appreciate that they are helping women support themselves. Thanks so much for this post. I follow you on Bloglovin Pearl. Thanks for all the inspiration! These are very nice pendants. There are many design ideas that would work for them. Not sure the comment went through, but I just tweeted again about your post and giveaway. I think it is so important for cultures around the world to share their story. One way is through jewelry - people all over the world can wear these handmade items and tell the story behind it. What a beautiful way to share diversity and humanity. Someday, it might help overcome the prejudice, the bigotry and the hate that continues to prowl the world. Kazuri beads are marvelous one of a kind beads that can easily be incorporated into stunning designs. That is one of the reasons many people purchase them. However, the main reason we all purchase them is because it is a very real way to help others who want the same things we do-to support and make life better for their families. I've used Kazuri beads in the past and would love to incorporate some in future creations. Love the whole Kazuri mission. I love Kazuri beads & the pieces I make with the beads always sell quickly. They are quality beads & the project is a wonderful way to help those in need. Pearl, I subscribe to your blog & follow you on Facebook. Thanks for all you do for the beading/jewelry community. These are so gorgeous. Shared again. Love the beads - and the opportunity to win a collection. Thank you! I love that it helps women. Just tweeted again. These are beautiful! Thanks for the giveaway. 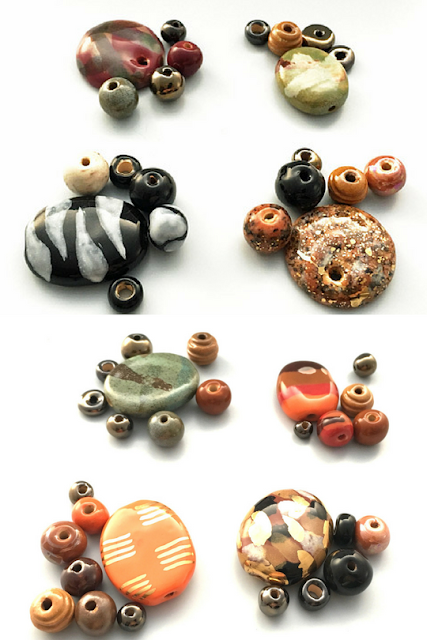 I just stumbled upon these Kazuri beads & pendants while searching for jewelry to make my first scarf necklace. I absolutely love them & they would be perfect! So glad they are able to put their wonderful talents to use & earn some money. It's a win for us to enjoy them & a win for them. Love these. Just tweeted again. Just tweeted again tis morning about these gorgeous pendants. I love these thanksw for the chance to win them. Because these are so gorgeous and for such a great cause, tweeted again. I don't know if this special giveaway is still going on, but I love Kazuri beads! Started collecting them in the early 2000's when I first saw them at a bead show... But now my stock is near bottom and I am about to buy new stock. This giveaway would be a great start! My few remaining necklaces (only three!) are still are my Etsy shop: www.etsy.com/shop/MoonbeamsLilacsRoses. My newer pieces will be ALL Kazuri with matching bracelets and earrings.